Governor Phil Bryant signed SB 2116 last Thursday at the Mississippi State Capitol. In an obvious effort to over-police women’s bodies, last week Mississippi Gov. 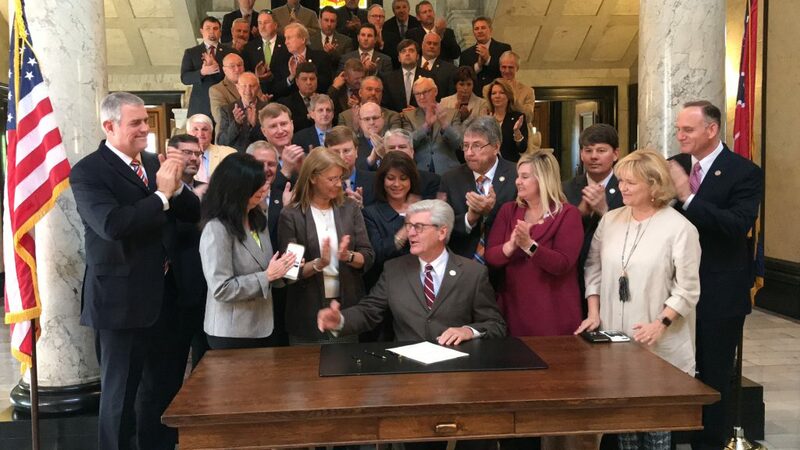 Phil Bryant signed SB2116, which prohibits abortion of an unborn individual after a fetal heartbeat has been detected, unless at risk of serious harm or death to the mother. A fetal heartbeat can begin as early as six weeks, which is before many women learn they are pregnant. Senate Bill 2116 follows an effort from 2018 to ban abortions after 15 weeks. District Judge Carlton W. Reeves swiftly ruled that law unconstitutional. Already, legal action is mounting against the bill, which is scheduled to take effect July 1. The Center for Reproductive Rights released a statement on the governor’s decision to sign the bill, ensuring the organization will sue Bryant and the state if the bill goes into effect. Lest you think it’s just the Magnolia State, Mississippi isn’t the first state this year to propose legislation that restricts access to abortion. Georgia’s House Bill 481 passed through the Senate last week, and now one last vote stands between the bill heading to Gov. Brian Kemp. Lawmakers in 11 states, including North Carolina, Missouri, and Tennessee have also brought “Heartbeat Bills” up for debate, but many have been blocked or determined to be potentially unconstitutional. Banning abortions after six weeks not only infringes upon a woman’s right to choose, but it sets up women and their families for unnecessary struggles if they aren’t able to afford a child, have access to healthcare or Medicaid for their kid, or even have teachers with enough resources to adequately educate them. Reproductive justice for all? We all know the answer to that.